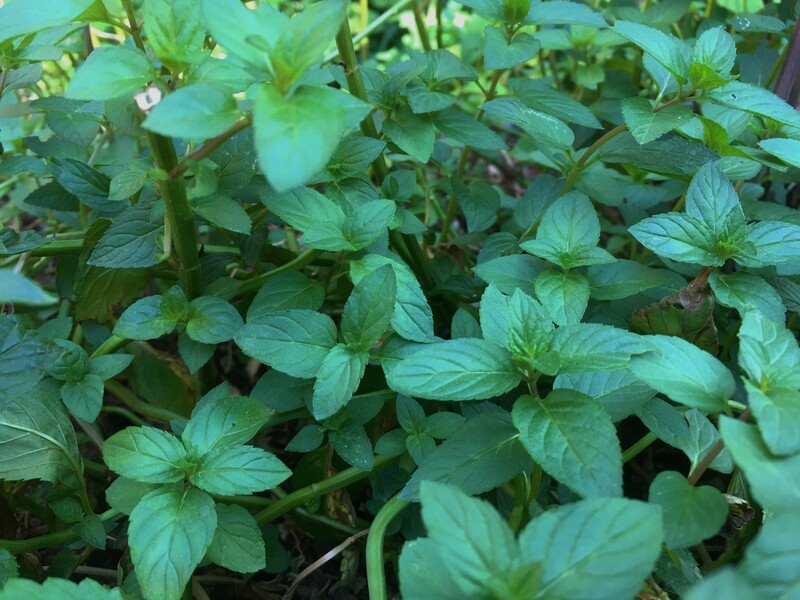 Peppermint is one of my favorite herbs to have growing in the garden. Here are a few tips on how to grow, use and enjoy this simple herb. Peppermint is very easy to grow. In fact, it grows so aggressively that most garden books advise you to enclose the roots of peppermint in a pot to prevent it from taking over your garden bed. I have mine planted in an old fashioned tin bath tub. Peppermint is part of the mint family, in which there are many varieties. 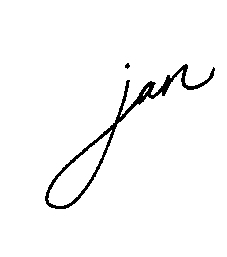 It will hybridize easily. So if you grow several mint plants side by side, over time their flavors will mingle and they will lose their distinctive tastes. Chocolate mint, pear mint, spearmint, and even apple mint varieties are available. Peppermint is easy to find in most plant nurseries and even in common variety stores where plants are sold. Herbs seem to sell out quickly in the spring, so don’t hesitate in purchasing early. It is easier to grow from a start or cutting than to grow by seed. If you know someone with a peppermint plant, you can take a cutting or divide the plant to start you own patch. Peppermint likes water, so plant it where you will remember to water it. It will begin to droop if it becomes thirsty. To keep the plant growing all summer, keep it trimmed. This will inhibit the plant from forming blossoms. Once it forms flowers, the plant will slow down. You may have to do this once a week or so. Divide already established plants in spring or fall, or take cuttings during the growing season and root them in water. Peppermint roots easily from cuttings. Take a 4 inch cutting and strip the last inch of its leaves. Soak it overnight in water and then just place it in a growing medium. It will root in two weeks and start sending up new growth. Cut: If you are going to use the peppermint for teas or other uses, you will want to cut down before it flowers. Cut the stems down to 4-5 inches from the ground. Don’t worry, it will grow back very quickly. Wash: Run the stems under running water to remove any dust or dirt. Dry: Take the stems and either place them in a dehydrator, tie with twine and hang to dry, or if you live in a hot, dry climate like I do, you can simply lay them on the counter top or table for a few days. 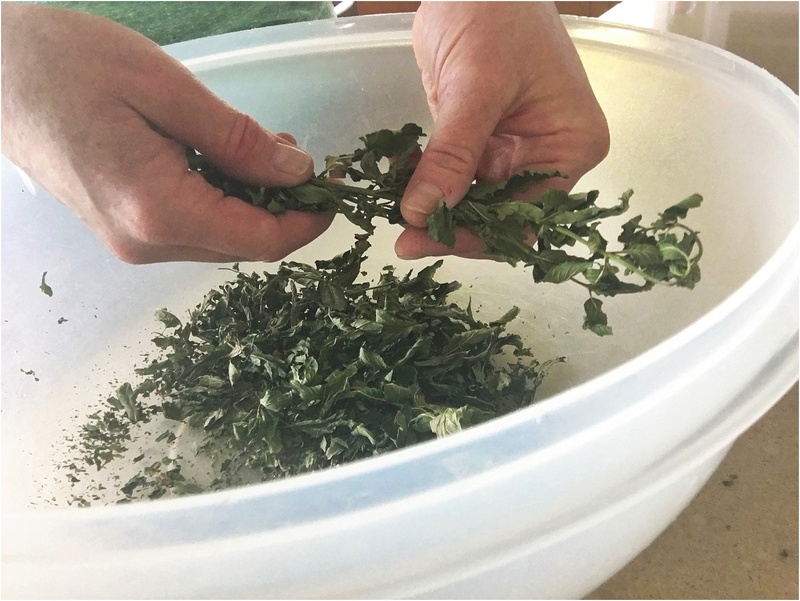 Strip leaves: To remove the dried leaves from the center stem, pull your fingers from the top of the stem down. Do this over a big bowl. Your house is going to smell fabulous! By storing the leaves whole and crushing them right before use, you retain the volatile oils in the leaves, until you need them. 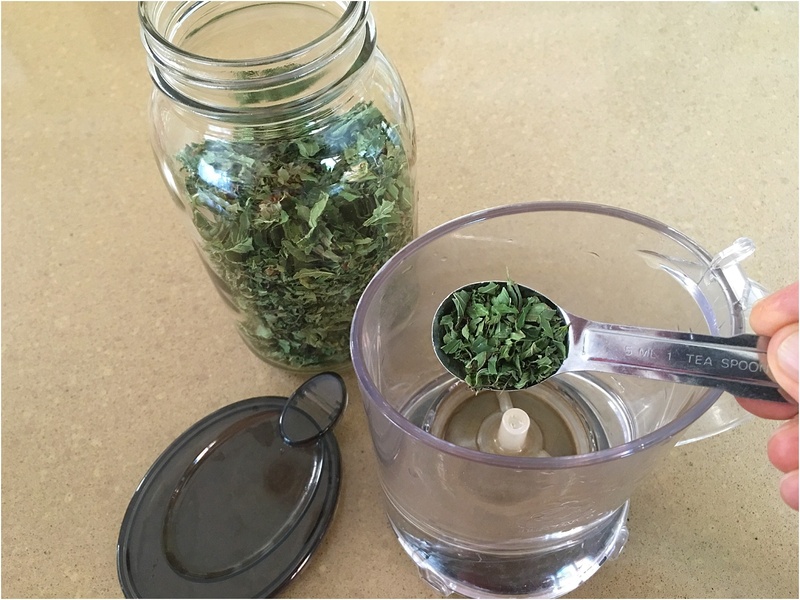 Store: Store the dried herb in glass mason jars with a tight fitting lid. It will stay strong and fragrant for at least a year if protected from heat, light, air, and moisture. What do you do with it? Peppermint has many benefits, whether you use it fresh, dried or as an essential oil. 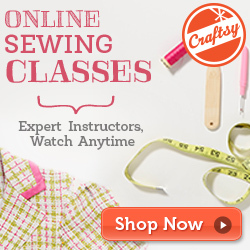 Peppermint is most famed for its use in relieving stomach problems. Peppermint can help disorders of the digestive system including gas, bloating, nausea, indigestion and cramps. One of my favorite ways to use dried peppermint is to make an infusion, a TEA. 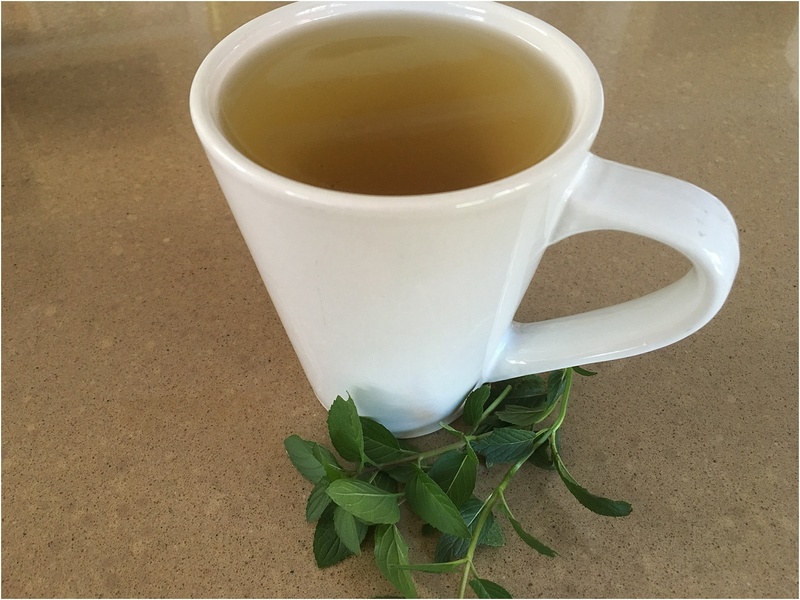 It can be very soothing to the stomach, give you a little energy boost, (without the caffeine) and add flavor to other teas that are not so tasty. I usually throw a little peppermint in with my yarrow tea to make it more palatable. 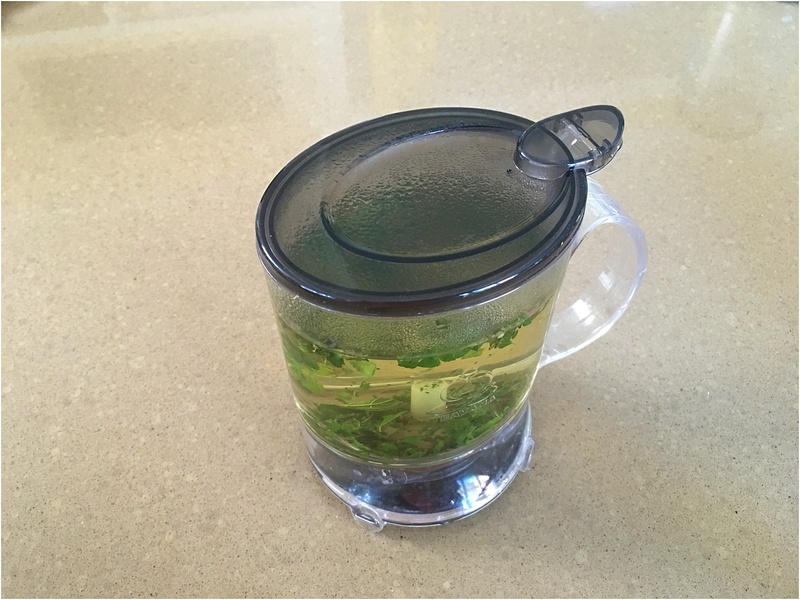 Add 1-2 teaspoons of dried herb to your mug. You can use a tea bag, a tea straw, or I LOVE my Teavana perfectea maker!!!! This makes steeping a mug of tea a SNAP! Everyone in my family has their own. Pour boiling water over the tea, cover and infuse for 1- 3 minutes. Covering the tea while steeping will keep the delicate oils from evaporating. Another way to get the benefits of peppermint is to use the essential oil. Take one to two drops in a Veggie Capsule to alleviate occasional stomach upset. Place one drop in palm of your hand and inhale for a mid-day pick-me-up. 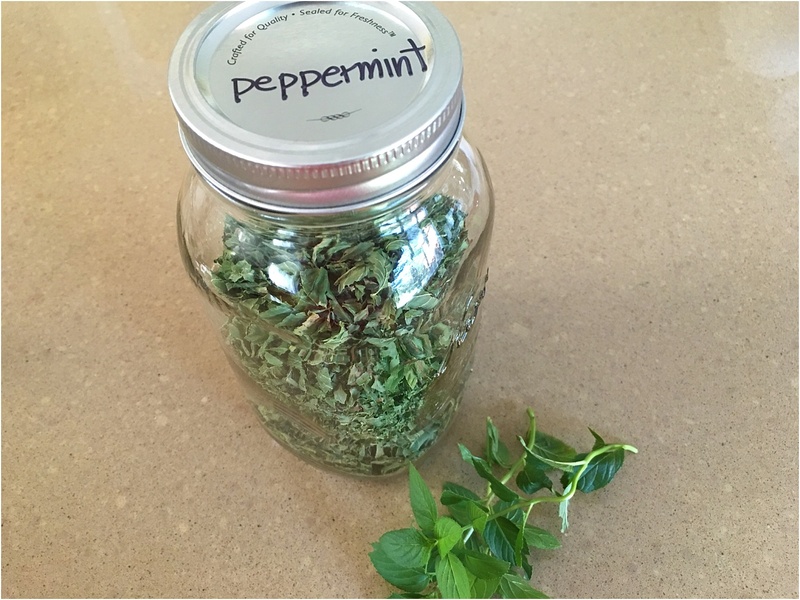 Add a sprig of peppermint to desserts, smoothies, or drinks as a garnish. If you don’t have a patch or bucket of peppermint growing in your garden yet, I hope you will. Not only is it useful, smells, divine, it is a beautiful addition to any garden. What is your favorite way to use peppermint?